If you have UberMenu – WordPress Mega Menu installed on your site, you’ll automatically see some extra options visible when you go to duplicate your menu. By default, both are checked, but you can disable these if you like. 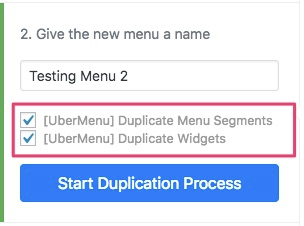 If your source menu contains UberMenu Menu Segments, the Duplicator will automatically recursively duplicate all segments, and link all the copied menus up properly when you duplicate them if you enable this option. If your source menu items contain any UberMenu widget areas, the Duplicator will automatically duplicate these widget areas, as well as the widgets inside them if you enable this option. The Duplicator will automatically trigger UberMenu to re-generate any custom menu item styles for the duplicated menu – this is important for individual menu item custom styles as the items in the new menus will have new IDs.